The President returns to the Shore to see how far the restoration process has come. The President spent the day at the Jersey Shore with Republican Governor Chris Christie on Tuesday. The two played Shore games like Touchdown Fever and Christie later gave the President a Chicago Bears teddy bear. Despite having separate political ideologies, the President and governor came together to show party lines mean nothing when it comes to how far we’ve come and how much more needs to be done in the wake of super storm Sandy. 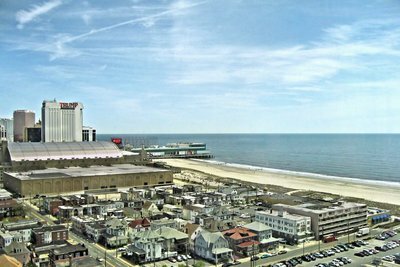 One of the newest attractions in Jersey’s famed tourist destination is the Margaritaville restaurant and gambling complex located in Atlantic City. The Margaritaville restaurant pays homage to the classic Jimmy Buffet song of the same name. Governor Christie spoke at its grand opening and was the first person awarded the honorary License to Chill –a plaque made of gold plated sandals. In Tuesday’s press conference President Obama also mentioned the relief effort in Oklahoma. “Part of the reason I wanted to come back here was not just to send a message to New Jersey but to send a message to folks in Oklahoma.” The President said. “When we make a commitment that we got your back we mean it.” President Obama visited Moore, Oklahoma on Sunday and promised federal aid is readily available for the tornado torn area. The EF5 tornado killed 24 people -10 of those being children- and left the town leveled last Monday. Subject: LongIsland.com - Your Name sent you Article details of "Obama Visits Jersey Shore Months After Hurricane Sandy"